Contants. List of Contributors. Introduction to the Series (A.M. Tartakoff). Preface (S. Gordon). Pathogen Strategies a Hitciker's Guide to the Macrophage (L. Ramakrishnan and S. Falkow). Antiphagocytosis by Yersinia: a Mechanism Involving PTPase-Mediated Disruption of Host-Cell Focal Complexes (K. Andersson, C. Persson and M. Fallman). Invasion of Mammalian Cells by Listeria Monocytogenes (R. Hurme and P. Cossart). The Role of Complement Receptor Type 3 in the Invasion Strategies of Mycobacterium Tuberculosis (M.R.W. Ehlers). Mycobacteria and the Endocytic Pathway (C. de Chastelier and L. Thilo). Legionella Pneumophila and Mycobacterium Tuberculosis: Two Pathways through the Mononuclear Phagocyte (M.A. Horwitz and D.L. Clemens). Phagocytosis of Pseudomonas Aeruginosa (D.P. Speert and D.A. Simpson). Interaction of Salmonella SPP with Host Cells (S. Murli and J.E. Galan). Shigella Host Cell Invasion: Significance in Pathogenesis (A. Zychlinsky and P.J. Sansonetti). Brucella Abortus Invasion and Survival within Professional and Nonprofessional Phagocytes (J. Pizarro-Cerda, E. Moreno, and J. Gorvel). En Route to the Vacuole: Tracing the Secretory Pathway of Toxoplasma Gondii (T.T. Stedman and K.A. Joiner). Active Cell Invasion by Toxoplasma Gondii leads to Avoidance of Phagocytic Processing (L.D. Sibley, V.B. Carruthers, D. Mordue, C. Mercier, and S. Hakansson). Regulated exocytosis of Lysosomes: A Novel Pathway Revealed by the Interaction of Trypanosoma Cruzi with Host Cells (A. Rodriguez and N.W. Andrews). Phagocytosis of Leishmania: Interaction with the Host and Intracellular Trafficking (M. Desjardins and A. Descoteaux). Cellular Mechanisms of Phagocytosis of Candida by Murine Macrophages (R. Kaposzta, R.P. 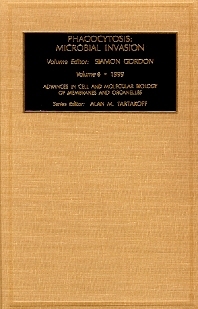 Da Silva, L. Marodi, and S. Gordon). Nonopsonic Fimh-Mediated Phagocytosis of E. Coli and Its Possible Contribution to Recurrent Urinary Tract Infections (S.N. Abraham and D.M. Baorto). Cell Co-Infections with Nonviral Pathogens and the Contruction of Doubly Infected Phagosomes (M. Rabinovitch, E. Freymuller, R.A. De Paula, P. Manque, W.K. Andreoli, and R.A. Mortara). Index. The present volume focuses on microbial invasion strategies of pathogen uptake. An accompanying volume (Vol. 5) in the series presents the phagocytic process from the viewpiont of the host cell. This field of study is growing rapidly after a somewhat slow start over recent decades. This collection of invited chapters attempts to reflect current research and brings together cell biologists, microbiologists, and immunologists wiht disthemes, hopefully like a symphony rather than a boring catalogue. It will be evident that editorial bias favors intracellular parasitism and medically important organisms. The neutrophil is far more than a supporting player to the macrophage and some attempt is made to remind the reader of some of its unique skills. To retain a manageable size, the emphasis is on relatively early events such as mutual recognition, cell entry, and response, rather than on longterm changes in gene expression by either host cell or pahtogen. Viruses are excluded not because of lack of importance but because of somewhat different research approaches, although it is becoming increasingly clear that large viruses (e.g. Vaccinia) and Listeria monocytogenes, share common strategies in invasion and intercellular spread. Dr Stuart Gordon works at the internationally respected CSIRO Textile and Fibre Technology in Australia. Both are well-known for their research in textile science.